Remember the first and only time GMA held the Artist Center Ball? On November 8, 2011, the GMA Artist Center staged its own ball at the Shangri-La Hotel in Makati. A majority of Artist Center talents attended the event, each of whom showed up in their most elaborate attire. The GMA Artist Center Ball was presented in response to the growing glamor of ABS-CBN’s Star Magic Ball. At the time it was held, the Star Magic Ball had been staged five times since its inception in 2007. The theme of the 2011 event was about the launching of the short-lived Profiles magazine. It was supposed to be GMA’s answer to the annual Star Magic catalogue magazine, but it only had one catalogue before it was shut down that same year. Unfortunately, the 2011 Artist Center Ball marked the last such event for the network. Lack of funds, declining television ratings and programming concerns were too much for GMA to handle, and they have not produced a ball since. On the contrary, ABS-CBN’s Star Magic Ball continues to put on a show for all of its talents. In fact, the tenth edition of the ball will take place tomorrow night, which should only add insult to injury for GMA’s Artist Center and even to Entertainment department head Lilybeth Rasonable. Five years after the last Artist Center Ball, there are still questions of what might have been. Regardless of the unfortunate circumstances, Kapuso faithful can only hope for the best, as GMA tries to make sense of their ongoing dilemmas. For those who may have forgotten the last GMA Artist Center Ball, Pep.ph has some interesting photo galleries to show for. Click the following links and look back at a time when Kapuso stars used to show up in their glamorous dresses and suits for this occasion. It seems that ABS-CBN is not used to airing a fifth primetime teleserye at 10:10 p.m. This was the case when ‘You’re My Home’ premiered last week to replace the top-rated ‘Pinoy Big Brother: 737’. So far, the series is off to a slow start, mainly because viewers are still trying to get used to watching another teleserye at night. 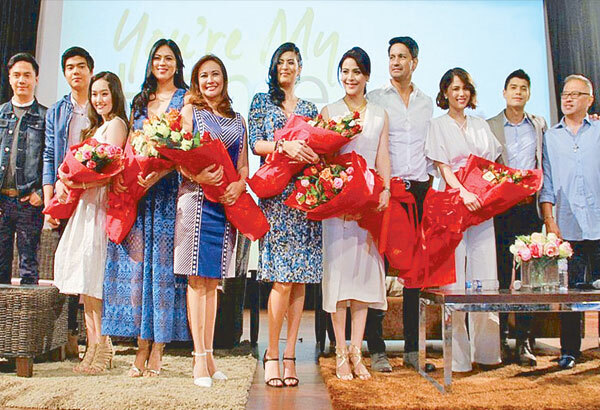 The maiden episode of ‘You’re My Home’ last November 9 earned an 8.8% rating in Kantar. In contrast, ‘My Big Bossing’ on ‘Kapuso Primetime Cinema’ garnered a 10.6% rating. The same held true in AGB Nielsen, although they only counted Mega Manila ratings. ‘You’re My Home’ finished with a 10.2% rating, compared to ‘My Big Bossing”s mark of 15.3%. For the week, ‘You’re My Home’ only managed around 9% ratings in Kantar, compared to the average combined rating of 10.5% for ‘Kapuso Primetime Cinema’ and ‘Bubble Gang’. In AGB Nielsen, ‘You’re My Home’ averaged 5% less than its competitors on the Kapuso network. Although ABS-CBN is starting to divert away from imported programs with this move, airing too many teleseryes on primetime appear to take its toll on viewers. Predecessor ‘Pinoy Big Brother: 737’, for example, performed well in the ratings, and that’s only because it aired as a reality show, thus providing a bit of a break for viewers. Even the Asianovelas that preceded PBB performed well for the same reasons. That said, it’s hard to see why the Kapamilya network decided to gamble on yet another teleserye on Primetime Bida, despite the fact that it may create the possibility of a viewer’s burnout. Nevertheless, it’s too early to tell how ‘You’re My Home’ will perform as the weeks wear on. Yes, it’s been only two weeks since it premiered, but ABS-CBN can only hope that the ratings will improve as the story intensifies. The resuscitation of GMA Network has once again hit a roadblock. It was announced Tuesday that talks between the said network and businessman Ramon S. Ang for the latter’s acquisition of a 30% share have been terminated. Responding to this sudden turn of events, Ang called the move surprising and unexpected, and promised to wait for any explanation by GMA regarding the situation at hand. This was not the first time that talks between GMA and a potential investor have ended without any conclusive results. PLDT and TV5 chairman Manny V. Pangilinan have also entered talks to acquire a portion of GMA’s shares in 2001, 2004, 2012 and 2014, only to collapse in the end. The latest development involving Ang and GMA marked the latest chapter in the decline and mismanagement of the network. Just recently, the Kapuso network have been involved in a pair of un-Kapuso-like decisions in relation to its business operations. Late last year, 52 GMA employees were laid off while fighting for the regularization of their services, leading to a protest by the group known as ‘Talents Association of GMA’ (TAG). Claiming there were ‘unfair labor practices’, the group recently held a protest in front of the GMA headquarters in Timog Avenue. Then in late April, GMA closed down four regional offices, canceled a pair of regional morning programs, and laid off at least 100 employees. The network claimed that they were merely streamlining its operations in order to increase ratings and revenue. Coupled with still-declining ratings and programming quality, it is now clear why GMA is going nowhere. The lack of urgency to improve and expand the business is taking its toll on the network. And it only made worse with its latest debacle involving Ramon S. Ang. This is now a hopeless situation for Felipe Gozon, Gilberto Duavit and the rest of GMA management. Without any support from other investors, GMA is destined to become an afterthought in the media industry, something they cannot afford to happen. They desperately need a new investor at this point. Perhaps a sit-down discussion with SM’s Henry Sy and family may help. Once again, ABS-CBN and GMA one-up each other when it comes to television ratings. For the month of January, both stations staked their own claims as the No. 1 television network in the country. Based on Kantar’s figures, ABS-CBN earned a 42% share over GMA’s 36%, while Nielsen’s figures say that GMA attained a 35% over ABS-CBN’s 33%. While ABS-CBN claimed to have won the ratings battle in Balance Luzon (45% over GMA’s 36%), Visayas (56% over GMA’s 26%) and Mindanao (48% over GMA’s 31%), GMA’s regional figures showed that the station only won in Urban Luzon (39% over ABS-CBN’s 29%) and Mega Manila (41% over ABS-CBN’s 26%). GMA failed to report on the figures for Visayas and Mindanao because both areas remain a weak point for the network. On the other hand, ABS-CBN did not report on the figures for the morning and afternoon blocks because of the network’s low ratings in both categories. ABS-CBN claimed victory in the primetime block, while in a separate statement, GMA won in the morning, afternoon and primetime blocks. As it has been the case for the past several years, the one-upmanship between the two stations continue to be a subject of debate among television fans. But the truth is, even with their claims as the No. 1 station, that doesn’t mean they are better than the other, especially when facilities, revenue, talent and programming quality are considered. That said, expect the game of wits between ABS-CBN and GMA to continue. At the end of the day, only one can lay claim to being the undisputed No. 1 station in the country.